If this was replying to me, no. My sat antenna started leaking maybe 6 months after I bought the truck. (You will see water down by the parking brake) Replaced with a new seal under warranty. I have had no issues again there or ever with the roof lights 2 years later. You do what you feel you need to. I had the leaking antenna. Easy warranty fix. No need to "check" your seals, if they are bad you'll know it. This is one of those "if it ain't broke don't fix it" or touch it. From someone who has never used E85, no issues flip flopping between E85 and regular? Also should you try to empty tank as much as possible before switching or it doesn't matter? Your right, depends on trim level and cab. 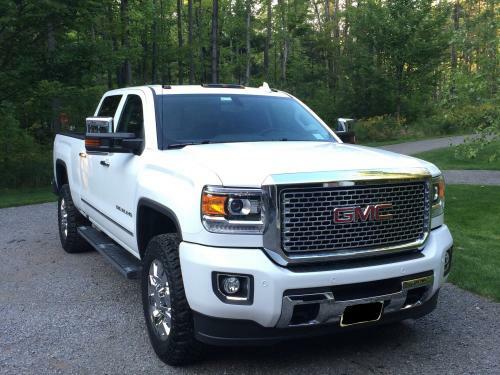 But all 2016 and newer 2500/3500 Denali have it standard on both engines. All 2016 and newer have the digital steering assist to my knowledge. If you have a '17 you have it. Its not an option. I'm guessing you have a 2017 truck. The 2016 and newer do not have a steering stabilizer and also no mounts to put one. What did you get? and I haven't been sure how one would affect the digital steering assist. I had the dealer change out my keys for ReadyLift keys. Kit includes shock spacers. My truck is raised approx 2.5 inches. Within a week one of the UCA ball joints boots had blown and all the grease was coming out. I decided to replace the UCA with ReadyLift UCA. After they were installed I noticed a significant improvement in the stability of the front end. Steering more stable much better ride than before. I know some will disagree on the UCA but this has just been my experience. If you don't change them I would be prepared to depending on what you find after you level. Cooper ST Maxx. 275/65/20. They are for sale if your interested. Been great. I really like it the best out of the covers I have had. Minor leaks, but nothing worse than any other cover I have had. Comes off quickly but definitely a 2 person job. Just had a ReadyLift level kit installed. I have a 2016 2500 with Nitto Terra Grappler G2 275/65/20 on 20x9 Grid GD1 +15mm offset. Did you change the upper control arms? Mine only have about 1/4" before hitting the stops. There are signs that they are hitting. The measurements the installer gave from before and after show almost 2.5" raised to level. Steering also seems a little loose.